"Working Title invites outstanding individuals seeking a career in film to apply for 3 one-year positions at our London office. We are looking for hard working and resourceful candidates, able to demonstrate the ambition and drive necessary to make the most of this unique opportunity. Successful applicants will have basic office experience, appropriate to entry level opportunities, and be able to express themselves with excellent verbal and written communication skills." For the full details, visit the website. Closing date is Feb 20th, 2009. Well worth a punt if you're fairly young and new to the industry, or just want to get ahead starting from the bottom up. Good luck! Elsewhere, Julian Fellowes is doing a talk at the Lighthouse in Brighton next Wednesday, for those interested and able to attend. PotDoll tagged me with the 'strengths & weaknesses' meme, which is a particularly tricky one, like that moment in an interview where you try to sputter what you're good at while fuzzing around another positive attribute but trying to make it sound like a 'weakness'. So, what do I think I'm good at as a writer, and where I need to improve? Well, I like to think I'm good at character and structure. I'm also good in the room: digging out ideas and brainstorming 'till the cows come home. And I can bash out plot fairly quickly. I'm a fast writer, or so I'm told. Where do I need to improve? All areas really, including the stuff I think I'm good at. Really want to push my work to a polished and consistent standard (so that you'll ALWAYS enjoy reading one of my scripts, even if it's not your thing or you're going to pass), and when I watch a good TV show or feature film, I realise that the bar is rising all the time (but this serves as inspiration, too). I'm not sure about my dialogue sometimes but that's only 'cos I worry if a line is necessary, or funny, or loaded enough, or could be replaced with a shrug, or whatever. Dialogue is the easiest to add and remove, so I'm always happy to play around. You can revise a scene enough times so that it becomes needle-sharp with what the characters are saying but dialogue riffs can be fun, too, so it all depends. Overall, fairly happy with my present standard of writing. All the usual insecurities and doubts will always be there but I can see a real difference over the years - my writing shifting, improving, maturing - and paid commissions always help to keep your eye on the ball as you see how you respond to external deadlines and demands. Who hasn't been tagged? That's everyone, then? M'kay. Sounds like you know what you're doing - what your strengths and weaknesses are. That way you know how you can better your writing. Think I might do the same thing to see what I should work on. thanks for joining in Danny! Good point about still needing to improve the bits we think we are good at as well as our weaker spots. Thanks for posting this. It got me thinking about my own strengths and weaknesses here - which may have led me to realise how to sort out a problem with one of my current projects. Danny I discovered this blog recently and last night finished reading every single posting you have made since 2005. 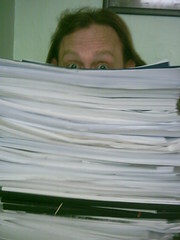 I have 2 45 page scripts and am sending them to agents and production companies. How do I ensure they read at least part of BOTH scripts? I think they are wonderful; but as they are episodic the second one has a few more special bits in. Antonia: Don't let that put you off! PD: Anything for you, m'dear. Iain: Hello! That link didn't work for me but I read your post via your profile. Nice one. NewDannyFan: You win the best nickname contest! Don't worry about your scripts. They should both get read, unless someone takes a thorough dislike to your writing and barely gets through your first script. But a good way of getting the 2nd script read is to make the 1st one end on a decent cliffhanger, so that they'll definitely want to check out what happens, or give them an easier way 'in' to the 2nd script rather than making them feel like they're trudging through your story. Aww, Danny, I won't. Thanks. Thanks Danny and do keep up the good work. Danny, do you have anything on your blog that deals with script spacing requirements? I know it's usually 12pt Courier, but should it be double or 1.5 spaced? I'm thinking specifically of the Alfred Bradley Bursary Award Scheme, which is to write a radio play. In the rules it does say double spaced, but I just wondered if this is the usual. It's taken my script to about 64 pages. I have read it out and it does look as though it will be around 45minutes which is the requirement, but having said that, I'm not used to 'reading' as such, so I could be 'off' by about ten minutes or so. It's also 5,400 words. I'm not 100% on radio format, as it varies a little, depending on what script you read. Check out the BBC writersroom, that should see you right... but what you describe sounds okay. Thanks for pointing out that the link wasn't working. It transpires a change I made recently completely screwed up all the permalinks and comments on my blog, and I hadn't realised it till now. The link in my comment above will never work, but at least the blog itself is sorted now. Cheers!